Barton, Chris. 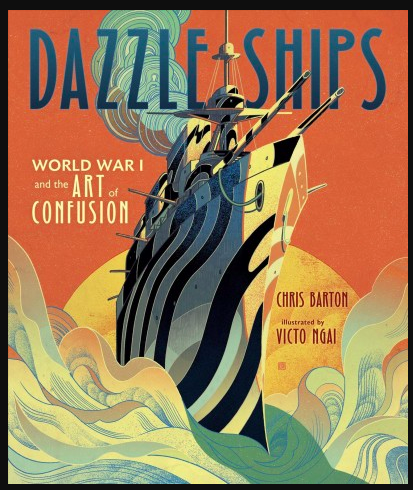 Dazzle Ships: World War I and the Art of Confusion. Minnneapolis: Millbrook Press, 2017. Why paint ships in eye-catching patterns? Why use striking colours? To confuse the enemy. German submarines were attacking British ships during the first World War. Not only warships but also ships bringing food to the island nation. A quiet unassuming lieutenant-commander came up with an idea: paint ships in bold colours and patterns that make it difficult to discern the speed and direction of travel. The German torpedoes would be less likely to hit the British ships. In 1917, the project began and by the end of the war in 1918, almost 3,000 British ships and over 1200 American ships had been painted in dazzling designs. This fascinating nonfiction picture book – illustrated by award-winning Victo Ngai – is beautifully designed. The style and size of the font complements the tone of the story and the brilliance of the artwork. Additional information – including a timeline and bibliography – is included at the end of the book. The rhythm of the story makes it wonderful for reading aloud but this children’s book is highly recommended for readers of any age interested in art and the history of war. Boyne, John. Stay Where You Are & Then Leave. Toronto: Doubleday Canada, 2014. 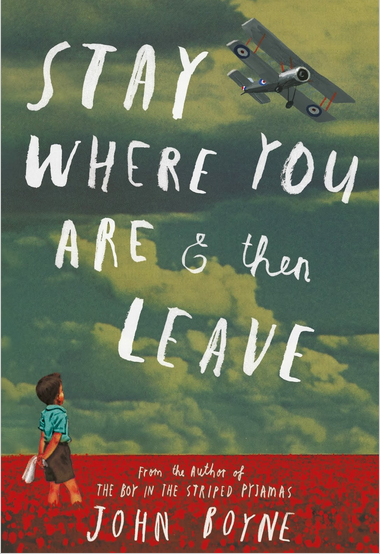 After his father has been away at war for four years, Alfie discovers his father is not on a secret mission at all but is instead a patient at a nearby hospital. Another highly recommended novel by an author who specializes in showing life from unusual perspectives. Eldridge, Jim. The Trenches. New York: Scholastic, 2002. Foreman, Michael. War Game: Village Green to No-Man’s Land. London: Pavilion Books, 1993. An award-winning picture book about four English soldiers who play football with German soldiers during the Christmas truce of 1914. The main characters are based on the author’s uncles who were in killed in the war. Highly recommended for readers 6-years-old and up. Granfield, Linda. In Flanders Fields: The Story of the Poem by John McCrae. Toronto: Lester Publishing, 1995. Greenwood, Mark. 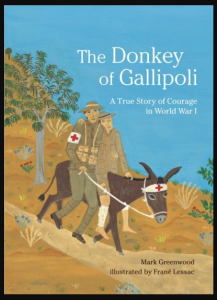 The Donkey of Gallipoli: a True Story of Courage in World War I. Cambridge, Mass. : Candlewick Press, 2008. Hartnett, Sonya. 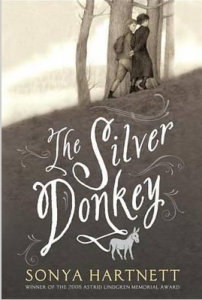 The Silver Donkey. Somerville, MA: Candlewick Press, 2004. Mattick, Lindsay. 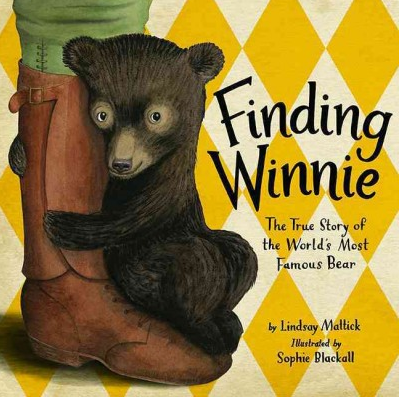 Finding Winnie: the True Story of the World’s Most Famous Bear. Toronto: HarperCollins Publishers Ltd, 2015. “During World War I, Captain Harry Colebourn, a Canadian veterinarian rescued a bear cub on his way to Europe and took her to the war.” – CIP. Written by the great-granddaughter of Harry Colebourn, beautfully illustrated by Sophie Blackall, and accompanied by historical photographs, this thoughtful informative book is highly recommended for readers 8-years-old and up. McKay, Sharon E. Charlie Wilcox. Toronto : Penguin Canada, 2003. 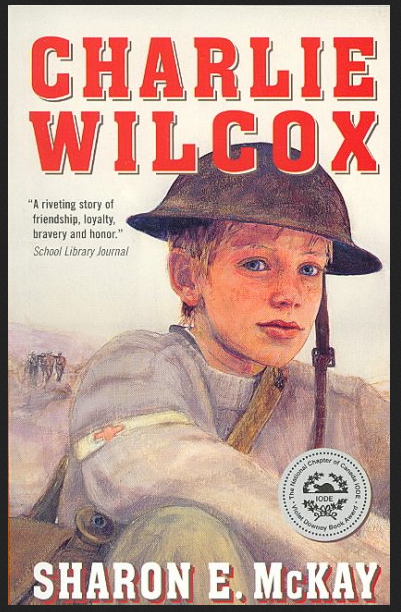 McKay, Sharon E. Charlie Wilcox’s Great War. Toronto : Penguin Canada, 2003. Morpurgo, Michael. Private Peaceful. London: Collins, 2004, c2003. 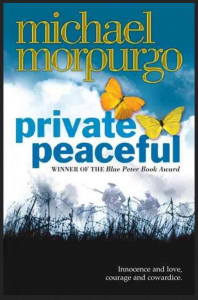 Morpurgo, Michael. War Horse. New York : Scholastic, 2007, c1982. “Joey the horse recalls his experiences growing up on an English farm, his struggle for survival as a cavalry horse during World War I, and his reunion with his beloved master.” – CIP Recommended for readers ten to fourteen-years-old. Murphy, Jim. Truce: the Day the Soldiers Stopped Fighting. New York : Scholastic Press, 2009. 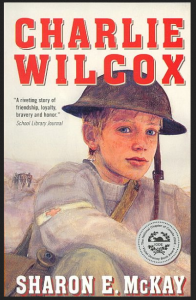 A nonfiction account of the 1914 Christmas Day truce. Raven, Margot Theis. 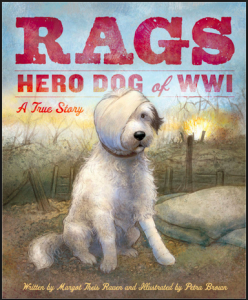 Rags: Hero Dog of WWI: A True Story. Ann Arbor, MI: Sleeping Bear Press, 2014. “A stray dog named Rags befriends a U.S. soldier in Paris, France during WWI. Rags traveled with the troops carrying messages from the front line to the back. His loyalty kept him by his owner’s side until Sergeant Donovan died at the base hospital in Chicago.” – CIP A nonfiction picture book for dog lovers 8-years-old and up. 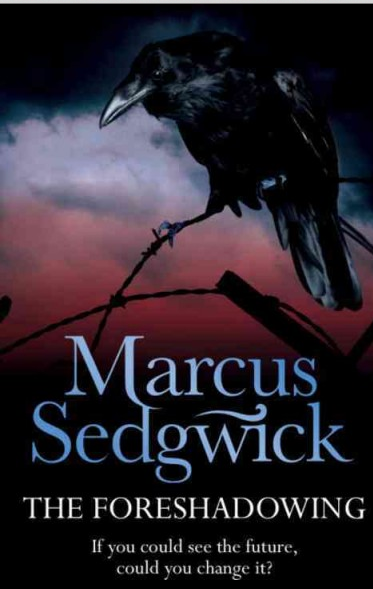 Sedgwick, Marcus. The Foreshadowing. London: Orion Children’s Books, 2006, c2005. 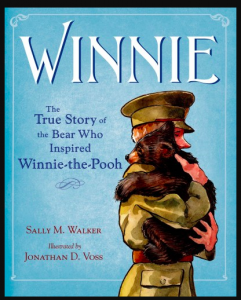 Walker, Sally M. Winnie: The True Story of the Bear Who Inspired Winnie-the-Pooh. New York: Henry Holt and Company, 2015. Winnie-the-Pooh is a lovable bear who lives with his friends in the Hundred Acre Wood. At least in the stories. But who was the real Winnie? This biography tells the story. Harry Colebourn, a Canadian veterinarian, adopted a bear cub which he took along when he was shipped overseas during World War I. Winnie became the regiment’s mascot, named after its hometown of Winnipeg, Manitoba. 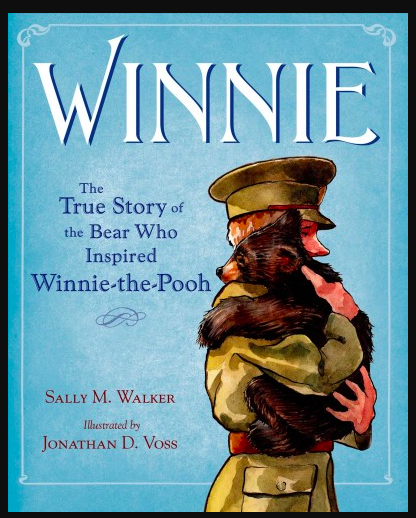 But when the soldiers were sent over to France, Winnie couldn’t go along. This picture book tells the story of what happened to the little bear and how it came to be known around the world. 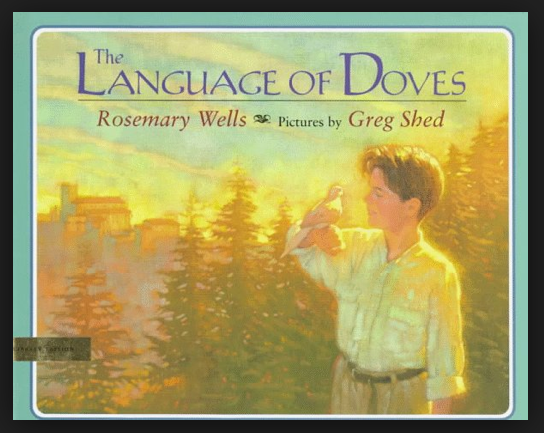 Wells, Rosemary. The Language of Doves. New York : Dial Books for Young Readers, c1996. 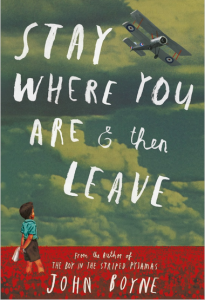 “On her sixth birthday Julietta’s grandfather gives her one of his beautiful homing pigeons and tells her a story of his experience raising and training doves in Italy during the Great War.” – CIP Highly recommended as a read-aloud for ages eight to ten.